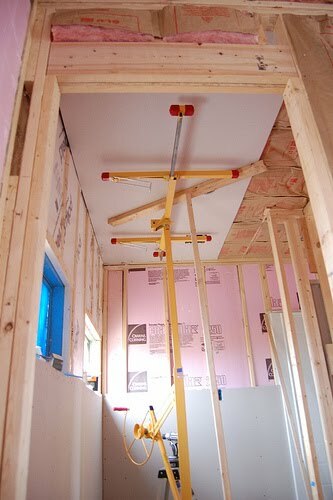 Amongst our friends and family, HandyMan is the go-to-guy for power tools (you have seen his garage, right?). Now I know how to use some of the tools but usually, when I do, HandyMan is right there by my side, telling me what to cut, how to measure, and how to build whatever project we're working on. I've never really had a project all my own (one that required power tools, anyway) but I hope to change that before the summer's end. I read a lot of blogs and sometimes I see the ladies getting right in there, down and dirty with the tools. Like Chris at Just Beachy. 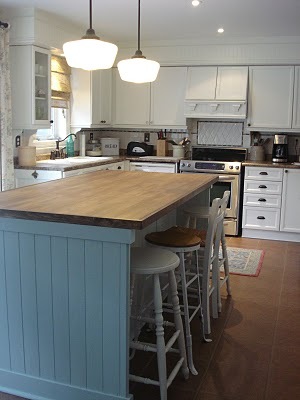 See this kitchen island? Yup, she built it. She has also built a pergola, wainscotting, bathroom tiling, reupholstery and sewing... I could go on and on. Her house is a DIY masterpiece, and she does all of it - design, execution, build - on her own (though hubby does help with some of the heavy lifting). 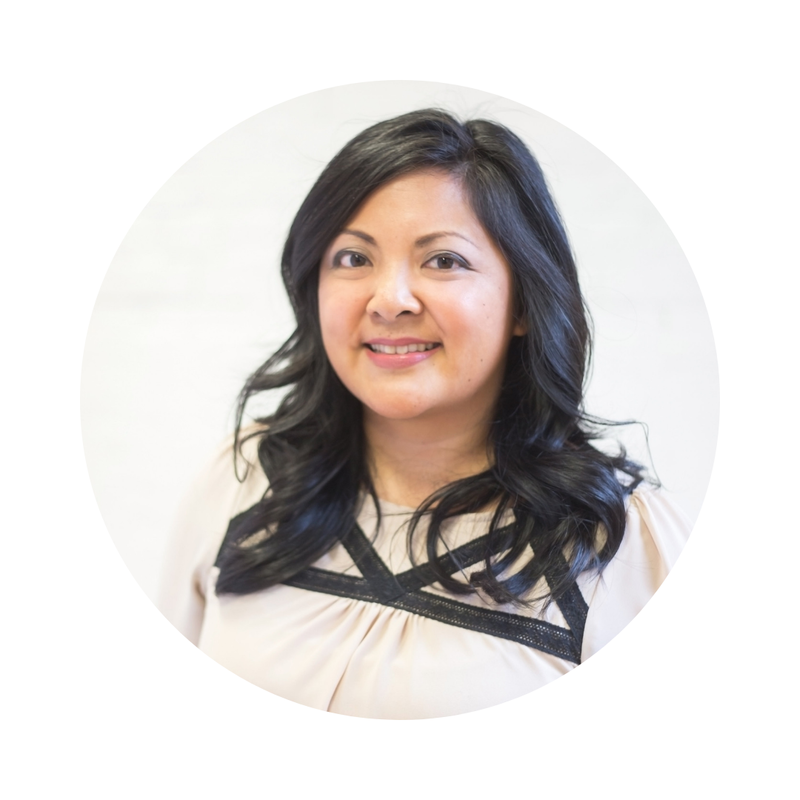 DIY Diva is another blogger I've mentioned before. She and her guy are currently turning an old gas station into a gorgeous country home - complete with donkey shed. Need to know how to hang wallboard by yourself - on the ceiling - and you're only 5'2? She'll show you how its done. 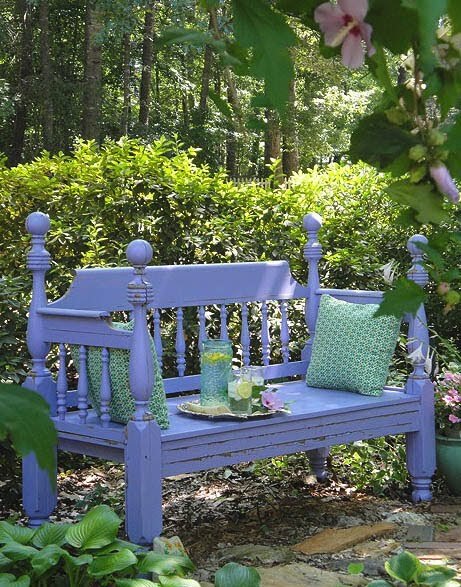 She can also show you how to build a picnic bench, lay fence posts, build crown molding and other tough tasks. If that weren't impressive enough, she has a tool collection that makes HandyMan weep with envy. Pretty Handy Girl is one my newer blog reads, but oh, she definitely lives up to her name! 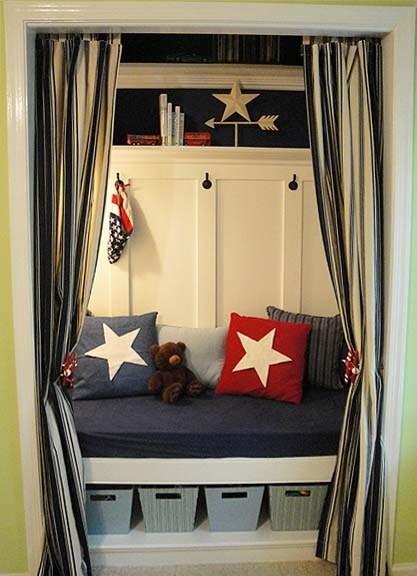 Here's two of her great projects: a garden bench made from a headboard and footboard, and a cozy reading nook built in a closet! Seeing all these projects has got my gears going! I want to build! I want to buy lumber! I want sawdust flying in my face! So what do I hope to tackle? 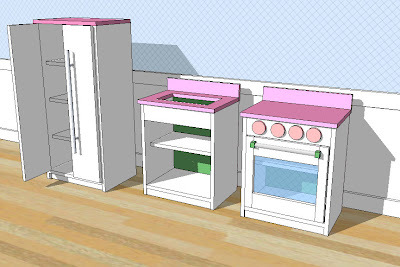 Well, I want to do this kitchen playset from the plans by another handy gal, Ana from Knock-Off Wood. Isn't that the CUTEST play kitchen ever?! Oh, how I would have loved to have this as a kid. And if Chloe's lucky, she will have one too, made by me. 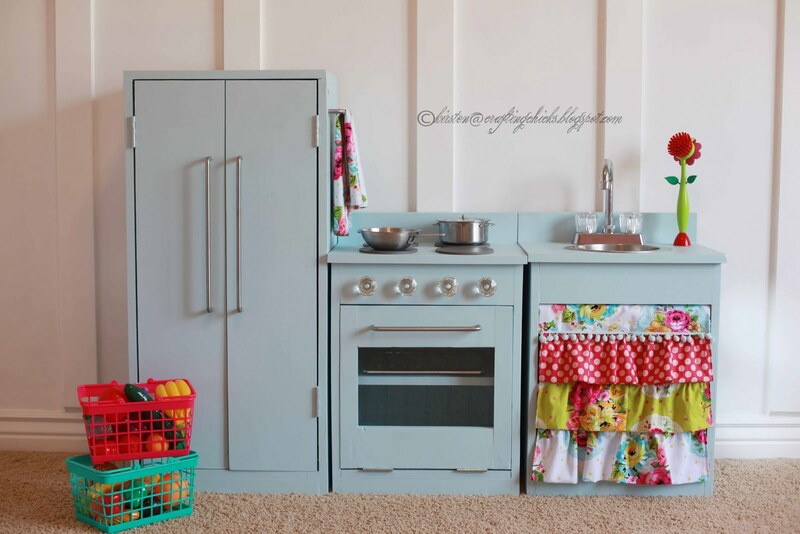 That is the cutest play kitchen ever! thanks for the links- I LOVE that kitchen. I am trying my hand at our kitchen. Thank you for the lovley mention , blushing!!! The more you use power tools the more comfortable you will become , circular saws still scare me , I will avoid using them at ALL costs , and the compresser used to literally make me shake but not anymore , gotta check out the other gals now. I'm so proud of myself that I made my very own little shelf and actually used a power tool in the process (with hubby's supervision, of course). It's liberating and it makes me want to do more! Right when I got to the part when you said you were going to have your Very Own power tool project, I threw both arms up and did a "woo hoo!" at my desk. A HandyGal you will be! I agree with Chris. The more you use them the easier (and more addicting) it gets. Can't wait to see Chloe's play kitchen complete! Wow, these women are impressive! I admit I always point to furniture and command/beg the hubs to make. I am in love with every single idea you guys have! So very inspiring! 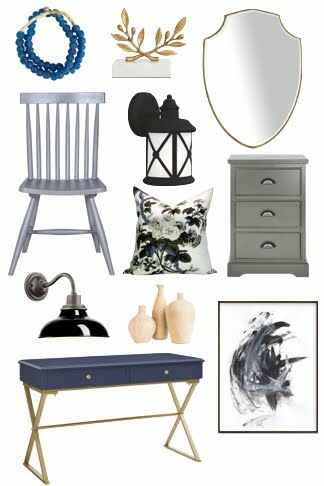 I just closed on a fixer-upper and will start demo in the next two weeks—entirely inspired by everything you're posting! Love knock out wood and I have been following chris over at just beachy for about 2 years now - she is amazing - I think my favorite was when she knocked a whole in her wall in a staircase with zero plan of what she would do next! Go for it with the kitchen - I'm sure it will turn out amazing! Go for it, no fear. You can do it. I love the kitchen, Chloe will love it too. I'm not EVEN ready to do more than sand, prime and paint. Oh, and DEMO! I love me some demo. I must live vicariously through folks like DIY Diva (who I LOVE!) and now YOU! Amazing women, I tell ya! I just want to go out and build something now!! Great post! I'm in awe of women who build...I'm still terrified of a saw! And that kitchen is too cute. fabulous links in this post! Have you ever seen the old TV units turned into play kitchens? Now that is impressive! I'm a designer wannabe too! My husband and I bought a fixer in Oakville last May and are slowly making it our 'dream' home. Lots of fun, lots of work! Our family thinks we're lost it, lol! I am LOVING that play kitchen! Gorgeous! All the power tools in the house belong to me and I wouldn't have it any other way. I grew up building with my dad, so I just kind of assumed all the other girls did too. DIY Diva is one of my first stops in ye-ole-reader but I'll have to check these other gals out too. That play kitchen is going to be super cute. Go for it! The kitchen is going to be adorable! I grew up around power tools but it hasn't been until recently that I discovered how much I love using them to build stuff (like our garage). Sure enough the construction bug has bit me and I can't wait to learn more about how to use the tools all.by.myself. I want to make that stove! It is perfect!! !...We don't have room for the full kitchen (I wish)...but I would love to have a little stove so he can cook while mommy (or daddy) cooks!